Beautiful pale palominio silver evening shoes by the designer Heavenly. 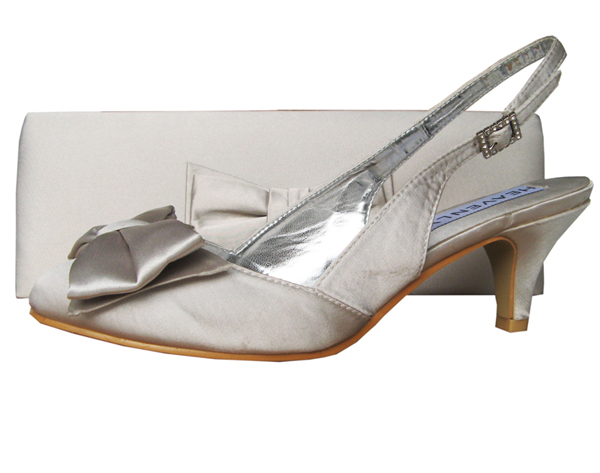 The evening shoes have an elegant closed toe shoe with a feature bow across the toes. Slingback ankle fastening for elongating your legs and a diamante encrusted buckle for that touch of sparkle. 6cm satin covered heel. A matching clutch bag is also available. Sizing advice: We have been advised from customers that the Twee ladies shoes are not a generous fit, so we will send you a size larger larger than your normal shoe size.